If you make waffles for your family often and find yourself spending way too much time on them, you can get a waffle maker that makes at least two large waffles or four regular ones at the same time. You’ll find that breakfast or dessert is done in double quick time! Get the best double waffle maker you can and the waffles will be perfect and the unit will be easy to clean. Of course, no waffle maker will be perfect if you don’t use the right recipes and technique to make them. One of the biggest mistakes that you can make is to use a cooking spray on the baking grids. These sprays tend to build up residue over time and cause batter to stick, making the waffles tough to remove. Only lightly wipe the surface with olive or canola oil. The second mistake is when detergent or soap is used to clean the plates. This too causes the life of the cooking grids to deteriorate fast. You should only wipe the plates with a hot wet cloth once they have cooled down. The final mistake is when cooks use too much baking powder in the batter. Reduce that and the waffles will come out cleanly. There are two types of double waffle makers to choose from. One has two grids separated in the middle and the baking unit can be flipped over to fill each grid. This makes two large waffles at a time. The other type is a single but large fixed horizontal maker with 4 grids. Each grid will be regular sized. The former usually takes up less counter space than the latter and the top and bottom of each waffle will be evenly browned. We’ve selected 2-3 of the best of each kind for you to choose from below. If you want a waffle maker that can make more than just waffles, like say sandwiches or pancakes, you’ll need a unit that comes with removable grids that you can switch out easily. However, units with fixed plates tend to turn out better quality waffles. Taking up very little space in your kitchen but making two large waffles at once, this style of waffle maker not only speeds up your baking but also ensures that every waffle is evenly cooked through and is just as crisp on the top edge as it is on the bottom. This is because each side of the maker flips upside down after being filed and closed. If you’re looking to make quality waffles at a middle of the road price, the Cuisinart WAF-F20 Double Belgian Waffle Maker is for you. It is the best-selling maker on the market and makes two 1 inch deep waffles at a time, one on the top and one on the bottom. The easy to use temperature dial lets you select the temperature for 6 different browning levels that best suits the kind of waffles you want to make. Two LED lights on the individual units let you know each side is cooking and 3 audible “beeps” let you know they are done. This is a 1400 watt unit, so it makes waffles quickly. Weighing in at about 9 pounds, it is a sturdy unit as well. The non-stick surface is a Teflon (PTFE) derivative, and it works best if you use a bit of olive oil or canola oil with each waffle. That said, although it is a consumer model, it has the capabilities to hold up to commercial use, which means for home waffle making, it’s going to last a long time. Of course, from one of the foremost makers of kitchen appliances, you would have to expect that an Oster product would be one of the best. And true to form, the Oster Double Flip Waffle Maker is right there. This is one of the least expensive double Belgian waffle makers on this list, but it brings 1400 watts of power to the table. At about 7 pounds, it is lightweight and easy to move, and it is the most uniquely designed units here. The temperature control dial, with little icons that show the color of the waffles from light brown to dark brown, lets you adjust the temperature right at your fingertips. There are warming and ready LED lights, and an LED that turns from red to green when your waffle is done. It comes in an attractive red color that will stand out on virtually any counter top. Always remember to use a cooking spray with this unit on the PTFE non-stick surface, but for the price, this is one of the best deals available. The above three give you two large waffles by providing two cooking surfaces that cook both sides evenly. The following options give you 4 regular sized waffles on fixed horizontal grid plates. Though you can make more waffles at one time, you’ll need more counterspace, so choose wisely if you have a small kitchen. You also may not get both sides of your waffles to be equally crispy or even as the grids do not flip, so be aware that the bottom can be crispier than the top. However, this may not be as big of a deal for you if quick cooking is more important. If you want the best and price is no object, then look no further than the Breville The Smart 4-Slice Waffle Maker. It will cost you 5 times more than the least expensive waffle maker on this list, but if the best quality waffles are your goal, you’ve come to the right place. 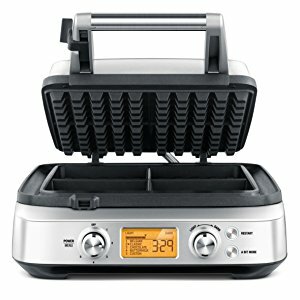 At 1800 watts and the engineering designed into it, this is a reasonably fast cooking double sided waffle maker and users love how consistently good each waffle is with even browning across. It is a true 4-slice Belgian waffle maker with deep pockets and each waffle being 4″ by 4″ and 1 inch thick. The casing is made of stainless steel and the cooking plates are nonstick cast aluminium. The whole process will be mess-free, as there’s a wide moat running all around the plates to catch any batter runoff. Since the moat is heated as well, that excess batter also gets cooked, so there’s no waste either! The digital display screen shows you your selection and counts down cooking time to finish. This waffle maker feature Waffle IQ technology that allows you to make 4 different varieties of waffles and lets you select from 12 levels of browning. The time it takes to cook is automatically determined from the settings you choose. For example, you can choose to make buttermilk waffles that are medium brown in color by turning the dial for the power menu setting and adjusting desired level of browning by turning another dial. The total time needed will automatically display on the LCD screen and will count down as soon as cooking starts, which is as soon as you close the top plate lid. There is a restart button and “a bit more” button if you want to increase cooking just a little more. If you find the combination of settings that’s just perfect for you, then you can program that in to use next time. Best of all, you don’t need to use oil or a cooking spray and you don’t have to wait between batches to let the plates warm up again. This unit is big and bulky, which means it might have to stay where it is planted on your counter. So, if you are a waffle connoisseur and have deep pockets, you can’t do better than this. However, if you don’t want to shell out that much for a waffle maker but still want the smart features and perfect results, there’s also a Breville 2-slice Smart Waffle Maker. There is also a manual 4-slice cooking version with just 5 browning levels and a power level dial and the rest of the features being the same. Four 1 inch deep Belgian style waffles is what you’ll get with this 1200 watt Cuisinart 4-Slice waffle maker. Each waffle will be 4.5 inches square but you can also use it to make one large waffle that is 9 inches square. Some customers said that you probably won’t need to oil the plates. The exterior is stainless steel, the baking grids are non-stick and you have two indicator lights. The green one illuminates once to tell you when you should pour the batter in and again when the waffles are cooked. The red lights up once you close the unit and the waffles cook. You can choose any one of five temperature settings. The electric cord wraps around the base when the unit is not being used and its footprint measures 14.2″ l x 10.2″ w x 4.7″ h and weighs 10 lbs. You can get this in plain silver or in red with a 3 year limited warranty. As noted above, you should not expect that the top of the waffles will come out as brown and crispy as the bottom, but that’s because the grids do not flip upside down. This one is priced the same as the Cuisinart double flip unit above, so it’s not cheap but not as expensive as the KitchenAid, and you can make 4 waffles at once. If you don’t like Belgian style thick waffles and prefer thin crispy ones, the Chef’s Choice Classic Pro is the waffle maker you should get. In fact it goes one step further – you can choose one of two settings for texture. One setting is for fast bake, which gives you crisp on the outside, moist on the inside, just like Belgian style. The second setting is slow bake, which will give you all-round crunchiness. In addition, you can select your temperature setting to control browning. Floating hinges ensure even thickness of all 4 waffles. Two indicator lights tell you when to pour in the batter, when it’s in the middle of cooking, and when the waffles are ready. The pockets are not as deep as Belgian waffle makers, so they won’t hold as much in toppings, but what you get is a thinner and crispier type of waffle. You will need to lightly oil the plates before each use. Click here for more crispy thin waffle maker options. This unit comes with only a one year limited warranty but there have been no complaints from Amazon customers of any problems with it.